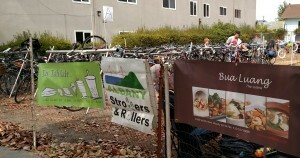 We again managed the Bicycle Valet Parking service not only at the lot below Masonic in Albany, but on Solano Ave’s eastern end at the Wells Fargo lot in Berkeley. Because of the expected volume, in addition to our own 18 “Moved By Bikes” Valet Racks, we rented some racks from neighboring organization Rich City Rides. 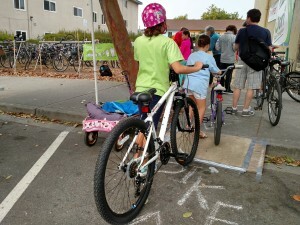 Lucky thing, because our volunteers parked about 330 bicycles in both lots over the course of the day! Can you imagine if even half those people had come by car? Many people told me specifically that if we hadn’t been there they wouldn’t have come to the Stroll at all – too far to walk, but a hassle to drive. 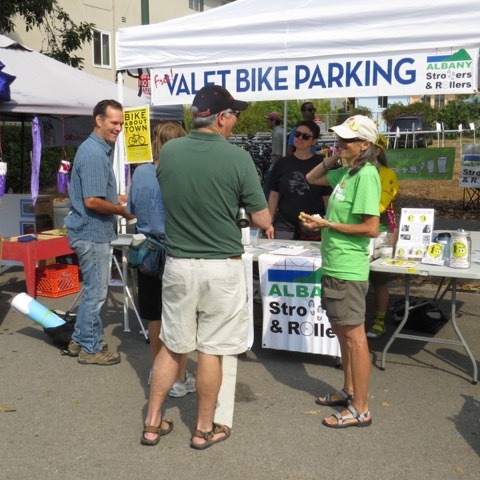 Thank you to all our Bicycle Valet Parking volunteers, led by Mac McCurdy, Sylvia Paull and Ken McCroskey – Mike Cabanatuan, Nick Pilch, Diego & Nico Chavez, Lyell Nesbitt, Tony Caine, Shauniece Van Eyck, Griffin Neal, John Alexander, Eileen Walsh, Flora & Becky McMartin, Alan Hsiao, Barb & Mark Altenberg, Joseph Friedman, Momoe Kato and Kate Rowland… as well as to Patsy Reese, who took a few photographs of volunteers at our booths. Many of you have helped us at previous events and some of you were first-time volunteers for us. You were all fantastic and got major kudos from everyone who came by! 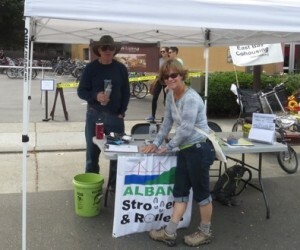 Tish Berlin, Britt Tanner, Sherie Reineman, Preston Jordan, Ken McCroskey, Kim Van Eyck and I (Amy) had a great time engaging people and doing outreach on behalf of AS&R and cycling in general. 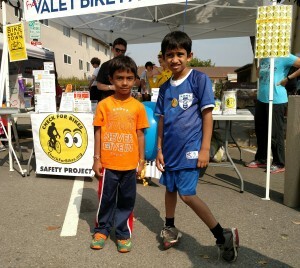 We spoke to so many festival-goers of all ages, answered questions about all aspects of bicycles, bicycling & walking signed up some new members (Tish and Sherie were stars in that regard) sold a bunch of “Check for Bikes” clings and bumper stickers…all while enjoying a (mostly) sunny day with friends and neighbors. Ken, Francesco, Britt, Nick and Mike were stellar with setup and Ken, Griffin, Tenisha, Francesco and Mac made the wrap go smoothly. Yes, you’re right – Ken was everywhere. Thanks, Pat, Bua Luang & Tay Tah! Roll ’em up, roll ’em down…on a home-made ramp built by Francesco! 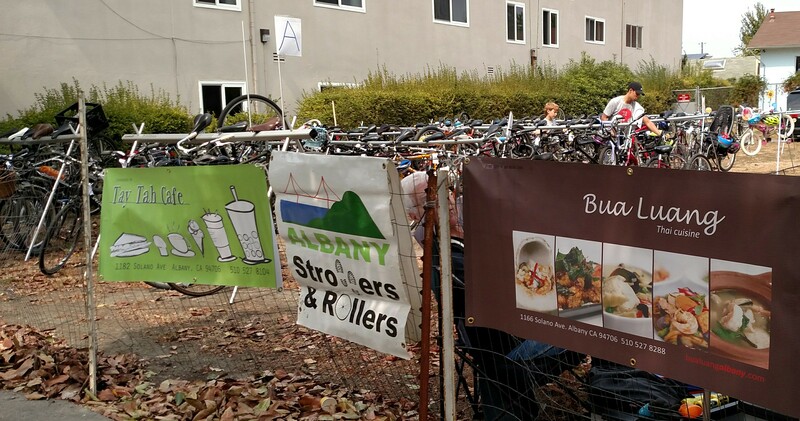 A big shout-out to local businesses Bua Luang Thai Cuisine & Tay Tah Café for again sponsoring our BVP service and providing delicious lunches & drinks for all the volunteers, as well as personalized coupons for the volunteers to use over the next few months. Pat’s support is so important and we really appreciate the effort she puts into helping us in all our events. 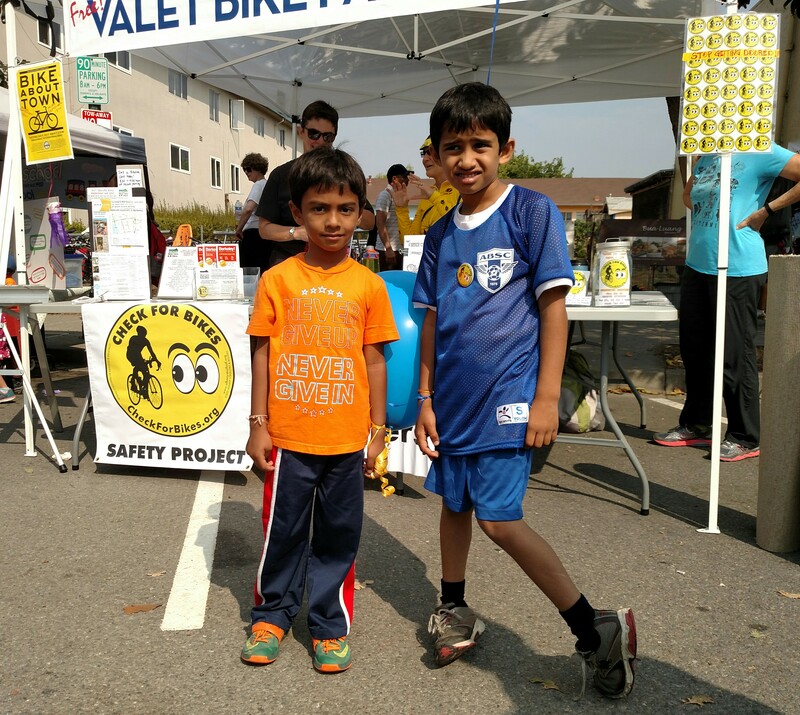 A final thank you goes out to the Solano Avenue Association, which makes Bicycle Valet Parking a priority for this huge regional event and puts us in a position to succeed every year. It’s an honor to be associated with one of the region’s longest-running and best street fairs!